On this flight we'll start something very different, something I think you'll find exciting. 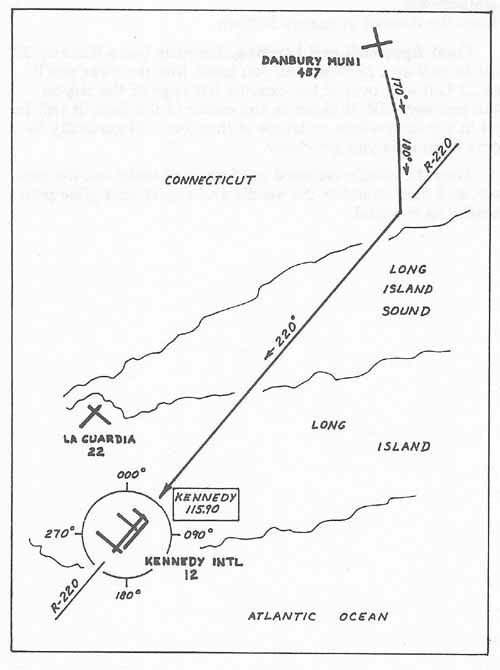 You'll depart from Danbury Municipal Airport and fly 47 miles to Kennedy International, but instead of finding your way by means of visual references on the ground, as you've done up until now, you'll use your NAV-1 radio. The needle on that radio receiver will guide you all the way from Danbury to Runway 22 Right at Kennedy. Then, as you approach the airport, there will be an interesting surprise in store … but more on that later on. The NAV Receivers. Just to the right of center on your panel are two large devices, one above the other. These are your NAV-1 and NAV-2 receivers—NAV-1 is the one on the top. Technically, these are very high frequency omni-directional range receivers. Commonly, they are referred to as VOR receivers. Fortunately, you'll find that it's easier to use them than it is to remember the technical name. VOR Radials. For now, all you need to know is that there's a VOR radio transmitter on the field at Kennedy, and it sends out a narrow radio beam that happens to be lined up almost perfectly with Kennedy's Runway 22 Right. The station also sends out 359 other beams, each in a slightly different direction, but right now you're only concerned with this particular 220° beam. We'll refer to that beam as the 220° radial of the Kennedy VOR, or simply Kennedy R-220. The Needle. If you tune your NAV-1 receiver to the frequency of the Kennedy VOR, and if you then set its the omni bearing selector on to bearing 220, its vertical needle will tell you where the 220° radial is. But that's enough for now. Let's get off the ground so you can see it work for yourself. You'll find our flight path shown in Figure 2-3. You're on the ramp at Danbury, with a heading of 350°, parallel to Runway 17—on which you'll depart. Taxi ahead, make a 180° degree turn onto the runway, and stop with a heading of 170°. Tuning NAV-1. Determine the keys for selecting the NAV-1 frequency and omni bearing on your version of the program. (On the 68000: Click on the display numerals with the mouse.) The frequency is shown by a digital readout on the panel, just to the right of the receiver; and the omni bearing is shown at the top of the instrument's oval window. Go ahead now, and set NAV-1 up as indicated. Needle Position. Notice that the vertical needle on NAV-1 is now sitting over against the left side of the oval window. This tells you that the Kennedy 220° radial is somewhere off to your left. After takeoff, the needle will begin to move toward the center of the window, telling you that we're getting closer to the radial. Then, when the needle is centered, it means you're right on the radial. Turn to the right, to heading 220°, and follow the radial directly to Kennedy International. The DME. One of the handiest avionic options on your panel is your DME (Distance Measuring Equipment). Just below the top right corner of the panel, there's a digital DME readout, which should now be displaying a number around 48. The DME is connected to NAV-1, and since NAV-1 is now tuned to the Kennedy VOR, the DME readout tells you that you're 48 nautical miles from that station. Departure. When you're ready, take off and begin your climb on the runway heading, about 170°. When you've established a 500fpm climb, turn right slightly to heading 180°, and then continue your climb to 2000 feet and level off. The needle will begin to move shortly after takeoff, but it won't reach center until after you level off. Intercepting the Radial. When the needle is just about centered—when it's just a bare half-needle width from center—start a gentle, half-standard turn to the right, to heading 220°. If you timed it perfectly, you rolled out onto the 220° heading just as the needle got to the center position. Course Adjustments. However, if you're now on a 220° heading but the needle is off-center, you have to make an adjustment. When you're almost, but not quite, on the radial like this, a 10° intercept angle will usually do the trick. Again, use shallow turns. If the needle is to the right of center, meaning the radial is to your right, turn right 10°, to 230°. Hold that intercept heading until the needle is centered, and then turn left again to 220°, to fly along the radial toward the station. If the needle is to the left of center, turn left 10°, to heading 210°; hold 210° until the needle is centered, then turn right to 220°. Practice Interceptions. Once you have the needle centered and are on a heading of 220°, turn away from the radial, and then turn to intercept it again, for practice. Move to the right of the radial. from your present heading of 220°, turn right to 240°. Hold 240° for two minutes, then turn left to 220° again. The needle is now a little left of center: You're flying parallel to the radial, which is somewhere off to your left. Return to the radial. Visualize the airplane and the radial as if you were looking down on it from above. Decide on an intercept angle of 10°. Now, determine what heading will bring you back toward that radial at a 10° angle, and turn to that heading and hold it until the needle is just about centered; then turn right to 220° once again. Move left of the radial and returning. Now repeat the same exercise by turning away from the radial to the left instead of the right, and then come back and intercept it. Re-establish your course and altitude. Keep an eye on the DME readout. Before you're 15 miles from the airport, quit practicing and establish a heading of 220° with the needle centered, at an altitude of 2000 feet exactly. Hmmm. Looks like the weather is starting to deteriorate. Weather Change. Fifteen miles from the airport, stop what you're doing, call up the Edit Page, and toggle down to the Cloud settings. (On the 68000: Use the Enviro menu.) Then enter the following parameters. Return to normal flight, and note that a layer of clouds has now moved in beneath you, so you're VFR on top. That is, you're still flying under visual flight rules, because you're above the clouds and in the clear, so you can see what's around you. However, we can't legally fly into the clouds without an IFR clearance. Requesting an IFR Clearance. An IFR clearance (referring to instrument flight rules, as opposed to visual flight rules) is a legal contract between the pilot and Air Traffic Control: The pilot, who must hold an instrument rating, agrees to fly a certain route at specified altitudes, and Air Traffic Control agrees to protect that specified airspace for the pilot—keeping it clear of other aircraft. So, at this point you have to either turn back or get an IFR clearance to descend through the clouds to Kennedy. Since I'm instrument-rated and we're instrument equipped, do the latter: Tune your communications radio to Kennedy Approach Control, and give them a call. Pilot: Kennedy Approach, Piper Three Zero Four Six Foxtrot. Pilot: Kennedy, Four Six Foxtrot 15 miles northeast of JFK on heading two two zero degrees at 2000; we're VFR on top, landing at Kennedy Request IFR clearance—we're instrument-rated and instrument-equipped. ATC: Four Six Foxtrot stand by one. ATC: Four Six Foxtrot squawk two zero four zero. Your airplane is equipped with a radar transponder, which is required for IFR flight. Just below the DME readout is another four-digit readout, the transponder code. Your manual tells you how to set those four digits. The transponder allows the controller to make a positive identification of the airplane on his radar scope, so that he doesn't get different planes confused, and it also gives him an automatic indication of the airplane's altitude. The code is usually set at 1200 for VFR flight, but change it to 2040, as directed. ATC: Piper Three Zero Four Six Foxtrot. Kennedy Approach. We have you twelve miles northeast of the airport. Maintain two thousand. Heading two two zero degrees. Expect VOR approach Kennedy Runway Twenty-Two Right. Contact Kennedy Tower on one one niner point one. So long. Pilot: Four Six Foxtrot. Thank you. So long. We have our clearance, so go ahead and contact the tower: They'll know who we are, because we've been handed off to them by Approach Control. Pilot: Kennedy Tower. Piper Three Zero Four Six Foxtrot. ATC: Four Six Foxtrot Kennedy. You're cleared for VOR approach. Runway Twenty-Two Right. Altimeter three zero point one zero. Wind two one zero degrees at five. The Instrument Approach. you've been cleared for the VOR approach to Runway 22R, so the tower will give you no further instructions. At this point you're on our own. Pull out your volume of published instrument approach charts; find the VOR approach for Kennedy 22R; and execute the procedure shown there. I have that approach plate here on my lap now, so I'll prompt you along the way. In any event, this one's a pretty simple procedure. Have the airplane set up for the approach—straight and level at 90 to 95 knots with 10° flaps (and gear down on the retractables)—before you're within 10 miles DME of the airport. Be at exactly 2000 feet, on a heading of exactly 220°, with the NAV-1 needle perfectly centered. At exactly 7 miles DME, reduce power and establish a standard 500fpm descent. That's 500fpm exactly. Keep the NAV-1 needle centered with gentle turns, as required. We're close to the station now, so the radial is getting very narrow: A 5° intercept angle will work out well to make adjustments. Keep the descent at exactly 500fpm. Final Approach and Landing. Kennedy has a Runway 22 Left as well as a 22 Right. As you break into the clear you'll see 22 Left way over at the extreme left edge of the airport. Your runway, 22R, is closer to the center of the field. It will be lost in the large white rectangle at first, but will gradually become distinct as you get closer. Keep the needle centered until you can make out the runway, and then abandon the needle and adjust your glide path visually as required.